Elisa Castillo de Pena has washed dishes part time at Sunset Station for the past four years. The 37-year-old wants a full time job and the employer-sponsored health insurance that comes along with it, but nine or 10 of her co-workers are ahead of her on a waiting list — and the little boy that she’ll give birth to in the next two or so months isn’t going to wait. Castillo looked at all her options when she learned she was pregnant. Divorced, a single mother and part-time worker, Castillo turned to Medicaid. The Michoacan native who has lived in Las Vegas for the last 20 years counts the medical assistance program as a blessing. One of her friends doesn’t qualify for Medicaid — Castillo thinks the woman may be undocumented — and didn’t have any insurance coverage during her pregnancy. Jenny Stiles was born with a form of polycystic disease — that’s the closest the doctors can come to as a diagnosis — that gave her six fingers on her hands, a hole in her heart and upside-down bowels. The 30-year-old has had her spleen and two-thirds of her pancreas removed, one kidney transplant and is waiting on a second kidney transplant and a pancreas transplant. One of her legs is two inches longer than the other, the joints on one of her hands are out of place and she has cataracts from the medicine she has to take. Stiles has been covered by Medicaid since she was three, qualifying under the so-called “Katie Beckett” option under Medicaid for children with disabilities who ordinarily wouldn’t qualify because of their parents’ income or resources, but had to reapply when she turned 18. She was denied the first time for not being disabled enough — despite 21 surgeries and being on 16 medications. Lysa Buonanno didn’t qualify for insurance during her 17 years as a part-time bartender. She always made sure her two kids were covered but between putting food on the table and new school clothes, insuring herself was always a second thought — until she landed in the hospital with lung cancer. A month after graduating college and two months shy of starting a job as a radiology technologist, Buonanno was in the hospital with a social worker filling out Medicaid paperwork to pay for surgeries on her spine, heart and lungs. More than 640,000 Nevadans rely on Medicaid, a joint federal and state assistance program that provides health care coverage to children, pregnant women, parents, seniors and individuals with disabilities across the country. An expansion of the program under the Affordable Care Act (ACA) in 2010 gave states the opportunity to augment the program to cover nearly all low-income Americans. But now Nevada and the 30 other states that opted into the expansion are grappling with the uncertain future of their state Medicaid programs in the face of a repeal-and-replace bill put forward by Senate Republicans that would not only phase out federal dollars for newly eligible adults in the expansion population but change the structure of the entire program. States would be left to become more efficient, expend extra resources or put payments to providers, services or patients on the chopping block. It was at Sandoval’s encouragement that Republican Sen. Dean Heller came out in opposition to the Senate health care bill at the same press conference, saying he could not support legislation that strips health care from 22 million Americans. But Heller — the most vulnerable Republican in the Senate up for election in 2018 — has faced immense pressure over his position on the bill, targeted by an advertising blitz by a nonprofit supportive of President Donald Trump, threatened by the possibility of a primary challenge and pressured with phone calls from Nevada gaming tycoons Sheldon Adelson and Steve Wynn. With Heller indicating that his position is unlikely to change without Sandoval’s support, the governor’s office has been fielding weekly and sometimes daily calls from Washington, including conversations with Vice President Mike Pence, Health and Human Services Secretary Tom Price, Senate Majority Leader Mitch McConnell’s office and Centers for Medicare and Medicaid Services Administrator Seema Verma. The history of Medicaid in Nevada begins in 1967, two years after President Lyndon B. Johnson signed into law legislation creating the Medicare and Medicaid programs. Medicare, a federally-administered insurance program, provides coverage to people over 65, younger disabled people and dialysis patients, while Medicaid is a joint federal and state assistance program for low-income individuals of all ages. The Nevada Medicaid program of the 1960s was known as SAMI — State Aid to the Medically Indigent — and covered low-income children, their caretaker relatives, the blind and individuals with disabilities, eligibility categories that evolved out of the old Elizabethan poor laws. States that chose to implement Medicaid — and receive federal dollars to match state spending — were required to cover specific groups of people and provide certain benefits. Nearly all states chose to opt-in to the program in the first four years that federal funding was available with the exceptions of Alaska and Arizona, which joined in 1972 and 1982, respectively. But the coverage available under the program in Nevada today has seen a significant evolution over its 50-year lifetime, a product of several federal expansions of coverage and other changes the state has made to the Medicaid program to leverage local government and private dollars for additional federal matching dollars. In the late 1980s, Nevada established the County Match Program to help counties care for the medically indigent by providing federal matching dollars to care for certain low-income individuals in hospitals, nursing facilities and other home or community based services. The program, which serves roughly 1,300 people a month, allows counties to provide the nonfederal share of Medicaid costs to the state in order to receive federal matching dollars. The providers also volunteered to be taxed, creating a roughly $30 million revenue stream that can also be matched with federal dollars, allowing the state to pay a higher reimbursement rate for skilled nursing care. Willden called the program “an important milestone in the Medicaid program,” with the higher rate allowing nursing homes to provide increased nursing hours and patient care. Various federal expansions in the late 1980s mandated states to provide coverage to pregnant women, infants and young children. By 1990, states were required to cover pregnant women and children up to age 6 with incomes at or below 133 percent of the federal poverty level and children ages 6 through 18 with incomes at or below 100 percent of poverty. The next significant expansion to health care for low-income Nevadans came in 1998 with the establishment of Nevada Check-Up, the state’s Children’s Health Insurance Program. The federal program, signed into law by President Bill Clinton in 1997, was designed to cover children in low-income families that make too much to qualify for Medicaid, currently households with incomes up to 200 percent of poverty or about $48,600 for a family of four. Children covered under the program — 26,050 in Nevada as of April — are required to pay a quarterly premium based on family size and income but don’t have to pay for copayments and deductibles like they would with a typical insurance plan. The state also chose to expand Medicaid coverage to uninsured women diagnosed with breast or cervical cancer at the direction of Gov. Kenny Guinn during the 2001 legislative session. The expansion allowed states to provide Medicaid benefits to uninsured women under age 65 with breast or cervical cancer or precancerous conditions. Nevada is also what Willden calls a “significant waiver state,” meaning it has a number of different waivers from the federal government that allows it to use Medicaid dollars in ways that otherwise wouldn’t be allowed. States use waivers to expand coverage, change delivery systems and alter benefits and cost-sharing, among other reasons. The Affordable Care Act, signed into law by President Barack Obama in 2010, forced states to expand their Medicaid programs to fill historical eligibility gaps by providing coverage to all low-income individuals who make at or below 138 percent of poverty, a provision that was later ruled unconstitutionally coercive by the Supreme Court in the summer of 2012 as it would have stripped existing Medicaid dollars from states that didn’t comply with the expansion. Instead, states would be allowed to choose whether they wanted to participate in the expansion and receive extra federal dollars or maintain the status quo. In the wake of the decision, Sandoval asked the Department of Health and Human Services, then helmed by Willden, to run all the data through all its spreadsheets. 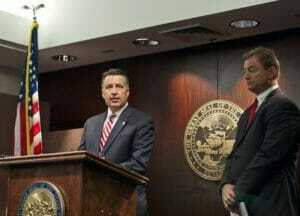 In December 2012, he became the first Republican governor to expand Medicaid. “Though I have never liked the Affordable Care Act because of the individual mandate it places on citizens, the increased burden on businesses and concerns about access to health care, the law has been upheld by the Supreme Court,” Sandoval said in a statement at the time. “As such, I am forced to accept it as today’s reality and I have decided to expand Nevada’s Medicaid coverage. Willden said the governor’s choice to expand Medicaid hinged primarily on two factors — the savings to the state in mental health spending and getting the state’s diabetic population the preventative care it needed to avoid costly emergency room visits. The governor decided that the newly eligible population in the urban areas would be covered through managed care plans — where the state pays a fee to a plan for each enrolled person — instead of the fee-for-service model, where the state pays providers directly for each covered service. In all, more than 210,000 Nevadans gained coverage under Medicaid expansion, roughly a third of the 640,000 across the state covered under the program. Rural counties have seen the most growth, with nearly 11 percent of people in Nye County covered under the expansion, 9.5 percent in Mineral County and 8.2 percent in Esmeralda County. Having a Medicaid card in your pocket doesn’t necessarily translate into services in the rural areas, which suffer from a severe shortage of doctors overall. But repealing the Affordable Care Act in a way that disrupts Medicaid coverage for the state’s rural population would “throw a wrench” in the entire health care system in rural Nevada, said John Packham, director of health policy research in the state’s rural health office. After Nevada expanded Medicaid, its uninsured rate dropped from 22 percent in 2012 to 12 percent in 2015, and it saw the largest percentage point decline in its rate of uninsured children, which dropped from 14.9 percent in 2013 to 7.6 percent in 2015. Under the ACA, coverage for newly eligible adults was fully funded by the federal government for the first three years starting in 2014, gradually phasing down to 90 percent by 2020. The newly eligible population currently costs the state $1.2 billion, meaning that the state would pay $120 million to cover those 210,000 Nevadans starting in 2020. The state has also restructured the way it provides mental health services by shifting away from state-funded services toward private providers who are paid back with federal Medicaid dollars. The governor negotiated with then-Health and Human Services Secretary Sylvia Mathews Burwell to get the federal government to reimburse hospitals $944 per day to take care of psychiatric patients on Medicaid instead of the $460 per day they were paying previously. Making psychiatric care more lucrative allowed private hospitals to absorb some of the demand that would otherwise be placed on state-funded hospitals such as the Rawson-Neal Psychiatric Hospital in Las Vegas. Shortly after the change, Valley Hospital opened a 50-bed psychiatric unit in Las Vegas, and statewide, the number of psychiatric beds has risen from 1,360 in 2014 to 1,624 in 2016. The question now — for the governor, for doctors and for patients — is what will happen to Medicaid and Nevada’s health care system as a whole if the Affordable Care Act is repealed and replaced. The Senate Republicans’ repeal-and-replace bill, which lawmakers have simmered on over the week-long 4th of July recess, would make two major changes to Medicaid across the country. The so-called Better Care Reconciliation Act (BCRA) would phase out the higher federal matching rate for expansion states over three years until 2023 and it would cap Medicaid funding over time on a per capita basis, which the nonpartisan Congressional Budget Office has estimated would result in 15 million people losing Medicaid coverage by 2026. In Nevada, that means that a $1.2 million total spend on its Medicaid expansion population will cost the state $420 million in the long run instead of $120 million. It would leave a future governor in the place of deciding whether to cut services, lower reimbursement rates, reduce the Medicaid population served or raise taxes in order to fill a $300 million budget hole. But some of those may not even be an option for the state. An analyst at a meeting of the Economic Forum earlier this year projected that Nevada could see a recession hit sometime around 2019, right around the time when the state would need to begin filling any budget hole created by a phase out of Medicaid. And though Medicaid expansion covers Nevadans making up to $16,394 a year, the biggest segment of the expansion population is made up of childless adults, many of whom make little to no income but previously did not qualify because they didn’t have children or a disability. Willden said that 65 percent of Nevada’s expansion population make no money, 26 percent have some source of income, 9 percent are receiving unemployment benefits and 8 percent had exhausted their unemployment benefits. Nevada is at the eye of the storm when it comes to states that would be most hard hit if the current version of the Senate health care bill were to pass. Meredith Levine, director of economic policy at the Guinn Center, pointed to the state’s expansion state status, the fact that it spends the least per enrollee and that it has the largest growing senior low income population as why the state could feel compounded effects from any changes to Medicaid in the state. The BCRA would also decouple federal funds from state spending needs, allowing states to choose either a block grant structure, which would give states a set amount of money, or per-capita caps, which would give states a set amount of money for each eligible individual. Federal increases would be based on the medical care component of the consumer price index beginning in 2021 and then switch to standard inflation in 2025. Diane Rowland, executive vice president at the Kaiser Family Foundation, said that change would effectively eliminate the partnership between the federal government and the states to provide health care coverage as embodied in the original 1965 legislation. 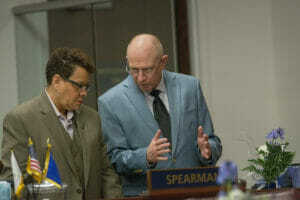 Democratic Sen. Pat Spearman, left, and Republican Sen. Joe Hardy talk on Feb. 9, 2017. But there are also those who think that maintaining Medicaid in its current form in Nevada might not be the best financial option for the state. Republican state Sen. Joe Hardy, a doctor by profession, suggested that it might actually be cheaper for the government to pay to cover Medicaid recipients with private insurance plans rather than administer the Medicaid program as a whole. “I think that discussion has to happen. What is it that we want to do? Do we want the bells and whistles on every single policy, or do we want to recognize that not everybody needs it?” Hardy said. In the meantime, doctors who treat a high number of Medicaid patients are worried that the progress that has been made toward getting traditionally uninsured populations in for regular doctors visits and engaging in preventative care measures could be undone by the current repeal-and-replace plan. Dr. Sumair Akhtar, who used to have about 30 to 40 percent of his patients on Medicaid when he was doctor to Culinary Union members, said that though the Senate health care bill could cut costs to the state in the short run, patients and the health care system as a whole will suffer from cutting off preventative care that could catch illnesses early on. Reporters Michelle Rindels and Luz Gray contributed to this story. Update 7-10-17 at 9:36 a.m.: This article has been corrected to reflect the fact that it was the providers, not the counties, that volunteered to be taxed as part of the County Match Program.